It's been so long since I have written that I don't know whether to give a "Where We've Been--for the last 6 months" post (yes, it has been that long! ), a "What's on My Heart" post or just not even bother! I'm ruling out the last one because I'm not ready to shut this thing down quite yet. If I'm being totally honest, I have gone back and forth between giving up on writing or continuing on with it. After reading the chapter titled "Run Your Race" in Jen Hatmaker's new book For the Love, I'm going to stay faithful to do what I can, even if I'm not that consistent with posting material because I think it's being used in some way or another. Even if it only resonates with a handful of people (and by people I mean probably only those who share DNA with me), for that handful, I think (hope??) it is worth it. I can't really say we've had a lot of big changes in our life in the last 6 months. Certainly compared to the events of 2010-2012 (miscarriage, cancer, all the stuff with Luis' career, moves), life has been pretty quiet for us--or at least as quiet as it can be with two little ones. Probably the biggest changes for us have been 1. We bought house, making us really, really real adults and 2. Eli started preschool. 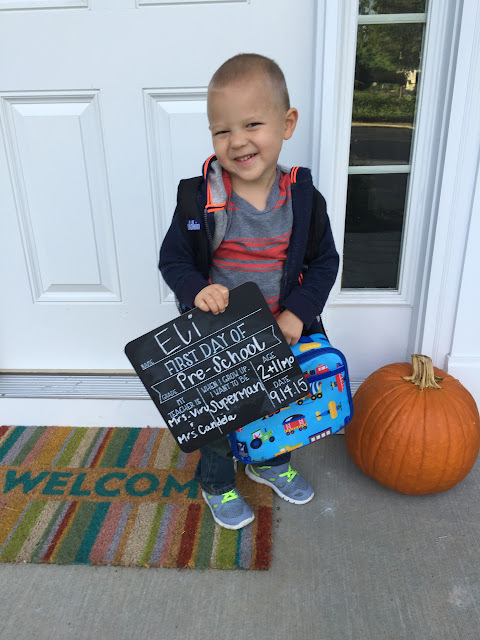 Two months in and I am still in denial that he is old enough for this. Today is a long overdue post that has been in the works for a month or so. I started it, got interrupted, lost my train of thought, shut it off, tried again, felt uninspired, turned it off, tried yet again, fought Eli over the computer, shut it off, tried to keep chubby baby hands off of the computer, failed to keep chubby baby hands off of the computer, shut it off, and well, you get the idea. I am determined though dangit and my in-laws are here watching my kids giving me a rare moment to myself so here it goes! It's a keepin' it real kind of post today, well this week I guess because I'm going to break up each "humbling moment" for the sake of your time and boredom. In a time where everyone is showing you their amazing highlight reel I'm rolling out the ugly and honest that will hopefully turn into encouragement for all of you--mom or not--by the end of this post. If not, then at least maybe the ugly and honest will help you feel like you're more put together than me. You're welcome for the boost of confidence. 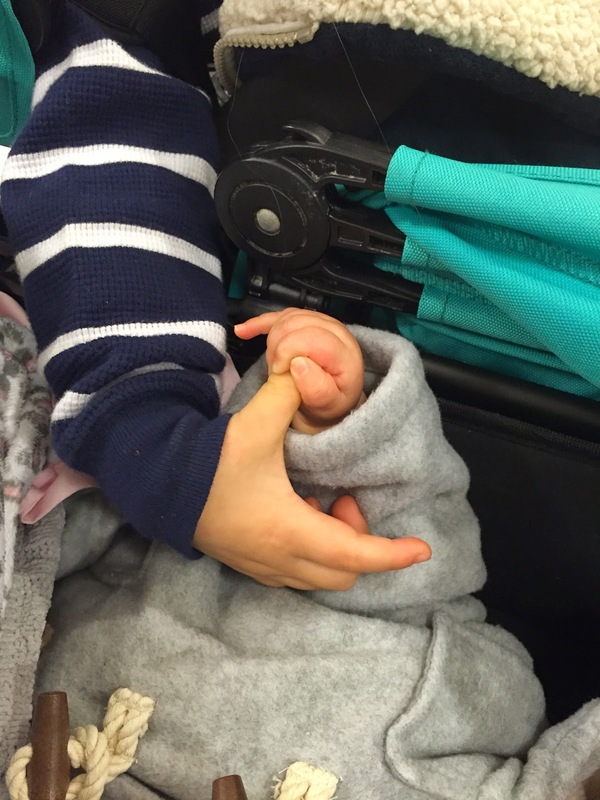 Over the last few months, I have had many a moment where my attempt to teach my son a lesson in kindness, sharing, selflessness, self control, gentleness, patience, being slow to anger to name a few turns into a lesson for myself. 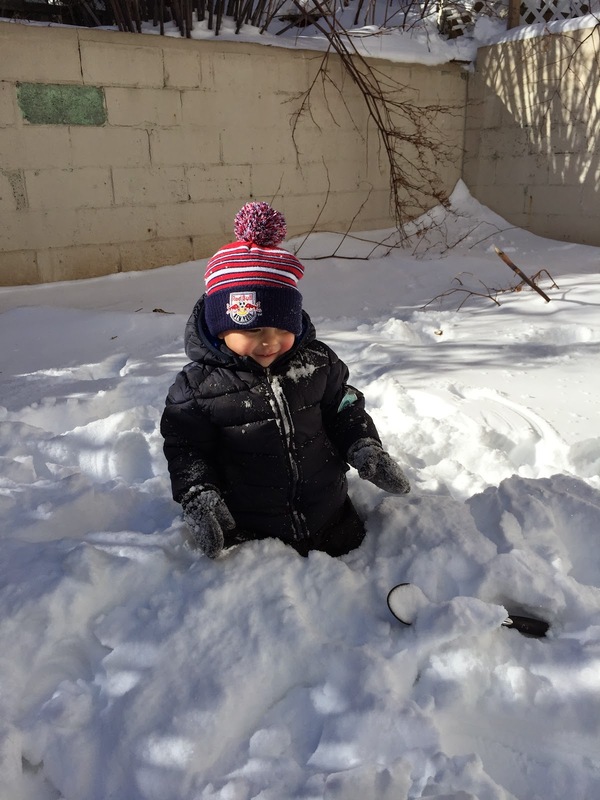 Back in late January/early February, when we had our first big snow I got really excited to get the kids bundled up so we could take Eli out to play. Luis had just left for preseason so I was doing the single mom thing and to say we were anxious to get out of the house is an understatement. 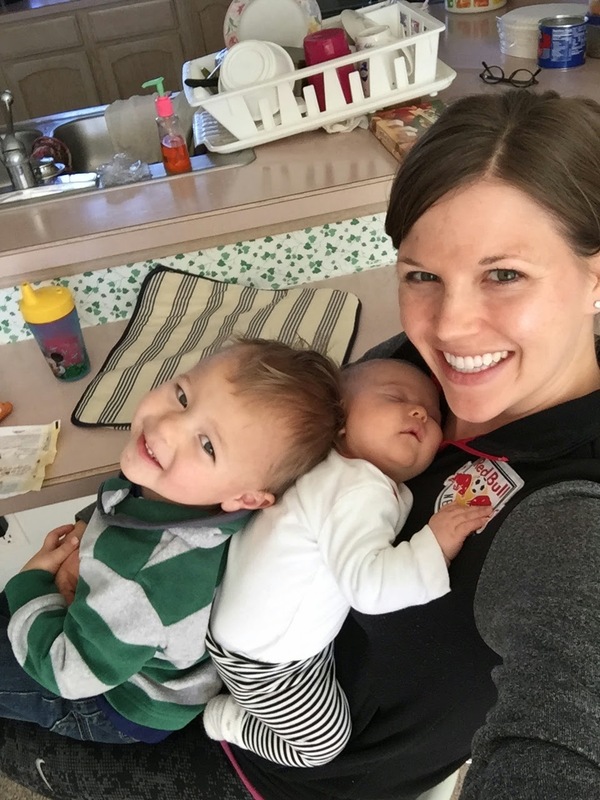 Cold weather + husband being gone + two kids = major stir craziness! I don't know if you've ever tried to get two kids and yourself ready in snow gear and out of the door but it's a feat, let me tell you. My babies wore layer upon puffy layer and the waddle it produced on Eli had me laughing for days. What didn't have me laughing was actually getting out to play in the snow. While the end result is an adorable and warm child, the process getting there is a major undertaking. It felt like I had spent an hour trying to get everything ready. I finally had both kids dressed and was trying to pull on my snow boots and tie them with Olivia strapped to my chest and she was screaming and Eli was pulling off the mittens I had just spent 5 minutes putting on him, making sure his thumb was in the thumb hole and they were tucked well under his sleeve so that no snow would touch his snow white skin. I was losing my patience with both of them which culminated in me yelling "This is supposed to be fun; you guys aren't making it fun!!" They're not making this fun? They weren't really the problem actually. Olivia was screaming because she was tired and it was my fault she wasn't sleeping yet. Eli was happy until the moment of me yelling which made me realize that I was the one not making it fun. In my desire to have my kids experience the joys of playing in the snow I was actually ruining the whole thing for them by setting expectations and getting disappointed when those expectations weren't met. I allowed my frustration over mittens and tying boots with a baby on my chest and annoyance that Olivia wouldn't just go to sleep steal the joy of the moment. And why really?? We had no schedule to stick to and no one waiting on us and Lord knows the snow wasn't going anywhere! 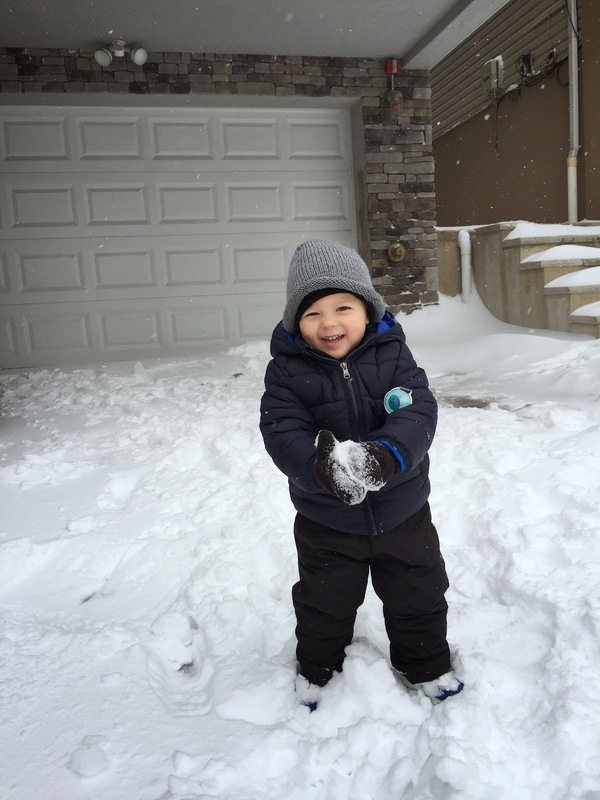 I needed to enjoy all of the aspects that come with playing in the snow--including the getting ready process--and I needed to not become angry when things weren't moving as quickly or as smoothly as I wanted. If I want my kids to learn to be joyful in all circumstances I need to be joyful in all circumstances. If I want my kids to learn to be slow to anger than I need to be slow to anger myself. And if I want my kids to have fun doing something, I need to have fun myself! Isn't that true for all of us in some way or another? Whether you're a parent or a friend or a spouse or a co-worker or a boss, there is something to be learned from this. Our attitudes our POWERFUL. We have the ability to affect people and they're experiences in a major way simply by how we approach a situation. While we can't control other people's happiness or level of fun, we can influence them because attitudes are contagious. Whatever your experiences and whoever you come in contact with today may your attitude be one that people want to catch. Maybe you don't need the reminder, in which case, you're awesome, keep up the good work. I want to be more like you! For the rest of us though, let's work to find at least one moment that we can choose to influence the people around us by finding the joy in all circumstances, even if that circumstance isn't what we hoped or expected. How's that for a midweek goal?? On this day of loooove and celebrating relationships, there's a sweet love growing in our house that has my heart a'melting. 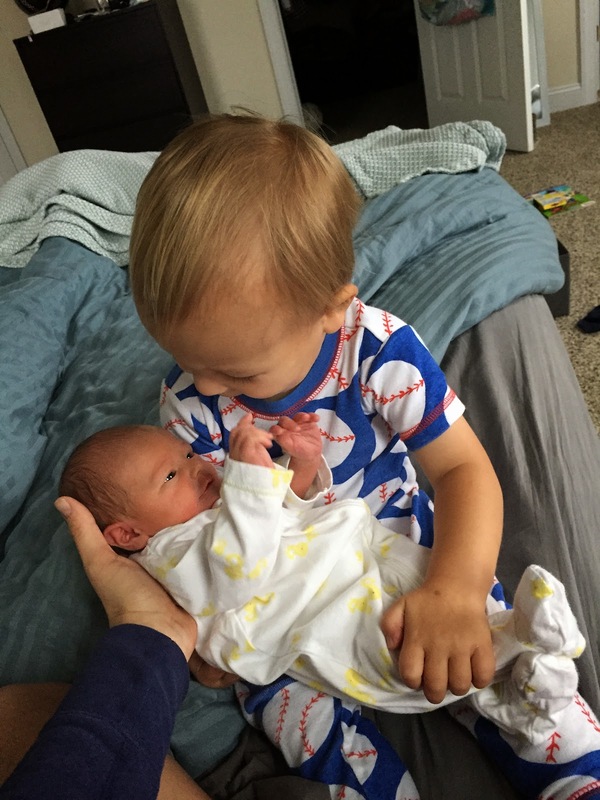 Eli has adored his "bubby girl" from the start. From the moment we first brought her home he has been eager to be involved. It has been far too long since I have sat down to write. If I'm being totally honest, I have certainly struggled to balance my time since Olivia joined our family. Partly because two kids is a total game changer and partly because we literally had someone visiting every week since she was born until the day we left for Arizona in the middle of December. We have continued the trend into 2015 and were on track for a record 4 months and counting of someone staying in our home (outside of Luis me and the kids) until this last week when an unexpected change of plans brought an end to the streak. I love, love, love having people stay with us, even in the midst of a new baby, but it does mean that some things fall to the wayside. The biggest ones for me being blogging and exercise. Also, the livability of our bedroom which becomes the dump zone for everything so that the rest of our home appears somewhat orderly for our guests. Admittedly though, I have become less and less concerned about our home being in perfect shape with each new guest. I do my best to keep things clean and tidy but at the end of the day if it doesn't happen I'm no longer going to stress to impress. I've been reading a lot about hospitality lately and the Lord's been working to help me prioritize what's really important when welcoming guests into our home. Do I strive to have my home clean and presentable? Yes, of course! I don't want people to walk in and feel like there's nowhere to sit or be grossed out by nasty toilets. But am I going to sacrifice time with my family to make it happen to the standard that I would like it to? Not anymore! I've concluded, in this stage of life, I just gotta lower my expectations and focus more on loving my husband and children well and making the people who come into our home feel welcome rather than making my home seem perfect for them. I don't want my desire for clean home to seem more important than the people living in or visiting it. Someday everything will be organized and stay in its place. Someday I will have hours upon hours to clean and straighten and make my home look the way I want. Someday I will have the time to cook fancy meals and bake pretty desserts. Someday my children will be more independent and won't need me around as much. Someday I will get a full night's sleep. (I look forward to that day the most!!!) Someday I won't be so exhausted by the end of the day. Someday I will start a project and complete it rather than getting interrupted and it sitting unfinished a month later. Today is for cherishing moments like this. Now that your bellies are as stuffed as the turkey you devoured its time to start thinking about Christmas. Having been on restricted activity for the last month of my pregnancy, I had a lot of time to read, paint my nails, stay caught up on texts, phone calls, emails, blogs and social media, and of course shop online. In my online searches, I came across some really cool companies that do some really good things for people and/or sell some pretty sweet products. You know those people who are just a pain in the bootay to buy gifts for? The ones that don't need anything, don't want anything or have such unique taste that you second guess anything you might consider buying them. Or those people (*ahem* my husband) who, everything they want is waaaay out of your budget? We all have at least one person that leaves us scrambling come Christmas, birthdays, etc. as to what to get them. If you're stumped for ideas this Christmas season, then hopefully some things on this list will help you break out of the "here's another gift card because I don't know what to buy you" rut. I first heard about this small online start up through a blog I love called Espresso & Cream. It was started by two sisters in Kansas just about a year ago. They are a monthly subscription service for...condiments?? Yep, condiments. Sounds a little funny but they're not just any ol' condiments. Their niche is finding "hidden-gem condiments that originate from all across the country. We’re here to help level the playing field between those big brands that can afford the shelf space today and the little guys who are making much more impressive sauces but can’t compete in the very dated grocery store model." All products are tasted and approved by their team before being included in their monthly box. Once a product has been sent out in the monthly box, it is then available for individual purchase on their website. "You are the first customer to purchase two of the monthly boxes for two different people, and we wanted to say thank you with a gift for you! We'd love to send you 2 products from our store, on us, as a small thank you for supporting our start-up." Now that's smart business if you ask me. 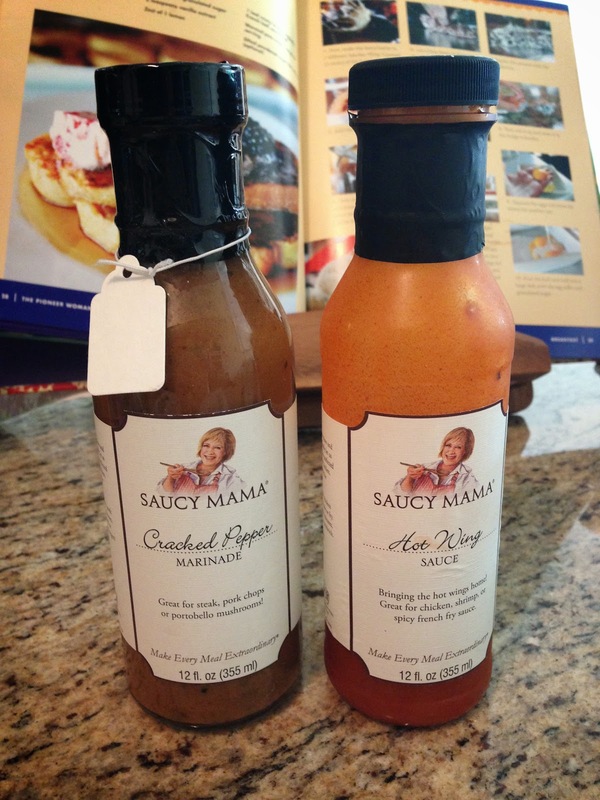 I chose two of the staff favorites, both from a company called Saucy Mama--Cracked Pepper marinade and a hot wing sauce. Let me just tell you, Franks has nothing on Saucy Mama. This Hot Wing sauce is so fresh and flavorful, it tastes like you made it yourself that day. It packs a punch too so if you like it hot, this one's for you!